The Sri Yantra also called Sri Chakra is a beautiful and complex sacred geometry used for worship, devotion and meditation. It has been in use for thousands of years and it's origin seems unknown. The central figure is composed of nine interlocking triangles. Every triangle is connected to the others by common points and this is the reason why it is so difficult to draw correctly. Changing the size or position of one triangle often require changing the position of many other triangles. After making a few attempts at drawing this figure it becomes obvious that it's not as easy as it looks. Given the fact that this is one of the oldest and most recognizable sacred geometry one would assume that a method for drawing this famous figure precisely would be easy to find. Not so. The two most famous methods from Indian origin, shown here and here are very imprecise and/or incomplete. After looking carefully at the figures produced by these different techniques one realizes that they are all different! Was there an original geometry that has been lost with time? Is there a way to find out? These are some of the questions that are answered here. The most common form of the Sri Yantra. The inner nine triangles are drawn with straight lines and are contained in circles and squares drawn on a flat plane. This is basically a 3D version of the plane form. The outline formed by the overlapping triangles are elevated in steps to form a pyramid. This is the rarest and the most difficult to reproduce. The figure is drawn or sculpted on a dome shape. The triangles are drawn with curved lines (spherical triangles) making it very difficult to achieve a precise result. Pictures of temples in the shape of the Sri Yantra and pictures of Sri Yantra carvings. 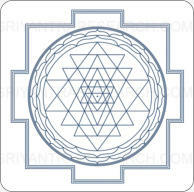 Sri Yantra created from Om? Bill Witherspoon - Art as Technology Great paper on the effects of the Sri Yantra on people, animals and the environment. Gérard Huet. Sri Yantra Geometry. Theoretical Computer Science 281 (2002) pp. 609--628 How model the Sri Yantra using a set of equations. C.S. Rao - SriYantra: A study of spherical and plane forms (1998) Comprehensive study of the Sri Yantra and it's many variations (flat, pyramidal, and spherical) Alexey Kulaichev - Sriyantra: The ancient instrument to control the psycho physiological state of man (1987) Study of the effects on the mind when staring at the Sri Yantra Alexey Kulaichev - Sriyantra and its mathematical properties (1984) Good paper on the geometry of the Sri Yantra. Alexey Kulaichev - Addition to Sriyantra and its mathematical properties Various methods for drawing the Sri Yantra. Marcus Schmieke - The most powerful Vastu tools to balance spatial energies. Yantras as a means of correction to balance the spatial energy in a house. Garrett Lisi - An Exceptionally Simple Theory of Everything Interesting resemblance between some of the patterns and the Sri Yantra structure. Madhu Khanna - Yantra: The tantric symbol of cosmic unity. Nice pictures of old Sri Yantras, some of them can be found in the picture galleries. Philip Rawson - The Art of Tantra. Nice pictures of old Sri Yantras, some of them can be found in the picture galleries. Dan A. Davidson - Shape Power A treatise on how form converts Universal aether into electromagnetic and gravitic forces. Howard Beckman- Mantras, Yantras & Fabulous Gems T.A. Gopinatha Rao - Elements of Hindu Iconography. Vol. I - part II, second edition 1971. Picture and drawings of a Sri Yantra from the Sringeri Temple. Dr. P.H. Pott - Yoga and Yantra The Hague, Nijhoff, 1966. Translated from the origninal published in 1946. György Doczi - The Power of Limits Proportional harmonies in nature, art, and architecture. Excellent book on the Golden ratio. Patrick Flanagan - Pyramid Power: The Millenium Science Peter Pearce - Structure in Nature Is a Strategy for Design The structural designs that occur in nature is the proper source of inspiration, Peter Pearce affirms, for the design of man-made structures.